Thank you to those who are supporting Daylight now, and those who supported us last year, in 2012! 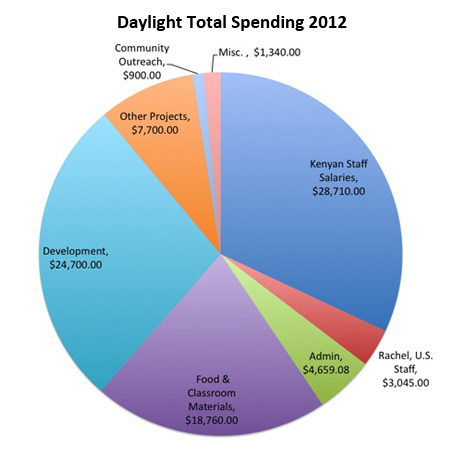 In 2012, supporters gave a total of $96,383.46 to Daylight; a 16% increase over 2011. 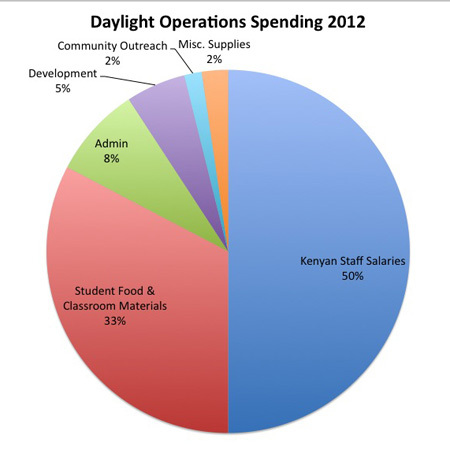 Of this total, $57,373.46 was donated to the Daylight General Operations Fund, which covers the cost of Kenyan staff salaries, food and classroom materials for students, and community outreach projects. Five percent of these general operations resources also supported development projects for Daylight classrooms and dormitory. And we are happy to report that only 8% of general fund donations were used to cover administrative costs. Many people also responded to special, designated costs, such as building development, supplies for the new dormitory, U.S. staff salary, travel, and dairy cows. Daylight raised $39,010.00 for these special projects in addition to the general operations fund. Note: In June 2012, Rachel Finsaas began working for Daylight as U.S. Director of Operations after fundraising her own salary. Nathan Roberts continues to volunteer his time. Be a part of the Daylight pie in 2013! Donate now. My fellow traveler, George, loves swings. His company revolves around swings and providing opportunities for individuals in wheelchairs to enjoy swings. George and his granddaughter, Megan, constructed three tree swings by the school, and one of the highlights of the trip was watching the lines of delighted Daylight students use the swings. My son, Pearson, offered to teach them how to do a back flip off the swing, but I thought that first we should just teach them how to pump their legs! The headmaster who told us the swings were helping him learn more about the children. He could identify which kids were the organizers and leaders, and then have them use those skills in the classroom. He could also note which kids were off to the side or by themselves and make sure he talked with them to see if they were homesick or having a problem. George spoke about “emotional income” and how important it was for each of us to receive “emotional income”. After seeing those kids and talking to the headmaster, I think George’s “emotional income” has made him a rich man. Making lunch at Daylight is a big job. It starts with milking the Daylight cows, shucking corn, sorting it, praying, and doing dishes for 200 kids, 16 teachers, and a handful of neighbors who may be visiting. We made this short video to help paint the picture a bit clearer. In rural Kenyan villages, nomads milk camels. Watch the video to see Board Member Brianna Menning giving it a try! Daylight is extremely excited to announce that we have applied for a 5-year grant with the Innove Project! The Innove Project is a new ministry of Colonial Church in Edina, MN. Daylight has ties to Colonial through board members, staff, and Michael Kimpur even has been to Colonial on several occasions. It is a grant specifically targeted towards Christian organizations that are run by young people. We will be interviewed, and our organization will be assessed by the folks at Innove. It is a long process and we may not know if we get all or part of the $250,000 grant until this summer. Please pray for us during this process! It is a huge opportunity and we would like your prayer support. Colonial Church invites proposals from idea-makers, 35-years-old and younger, residing in the greater Twin Cities region, to submit proposals for projects that “break new ground” for the sake of cultural betterment and human flourishing in accordance with gospel values of faith, service, grace, justice, love, redemption and reconciliation. Innové provides $250,000 toward project grants, along with human resources, expertise, time, networking, creative community, incubation and acceleration toward successful project launches. A HUGE thanks to Rachel Finsaas for doing a fantastic job with the application, and to Joyce Schwartz for encouraging us to apply.